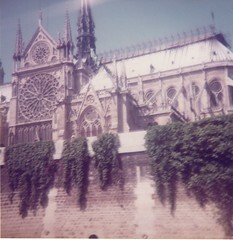 I visited Notre Dame cathedral once. 12-year-old Phil was on a school trip to France, the first time I'd been abroad, and we were left to our own devices for an hour or so. Having visited several cathedrals on holidays at home, I did what was expected and had a look around. All I remember was it being cold, dark and gloomy. As I recall, the only light was from candles and you couldn't really see much. Earlier in the day, we'd been up to the second level of the Eiffel Tower, and so I quickly headed out to the souvenir shops that surrounded the cathedral and bought miniatures of the pointy building I really had enjoyed - even though the attendant had taken my money for a ticket, then the ticket supplied by the teacher that I was supposed to hand over first and didn't give me the cash back. Basically, I don't recall the cathedral with any great enthusiasm, but any building that survives several hundred years is very special. I always want to know the stories it could tell and the things it has seen. The fires still raged when the news reports started banging on about restoration and this got me thinking. Surely in history as long as this, a fire, even a major one, is just another event for the guidebook. One day, tourists will be taken around a fully intact Notre Dame and be told by the guide of those events in 2019. My thought was, "I hope they put a bit of the 21st Century in it." Maybe I'm jaundiced because I live in a town that has suffered more than most from a desire to look to the past, but I like to think that change is natural and not the terrible thing that some claim. A few miles from me is the Regent Hotel. 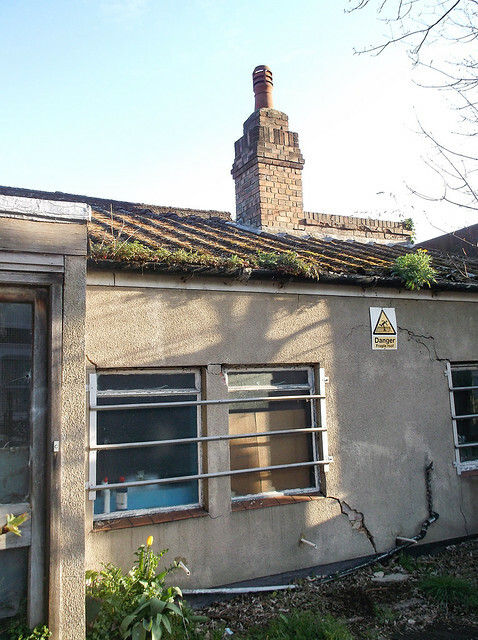 Once a five-star establishment, it fell into disuse and sat in the middle of the town boarded up. Attempts to turn it into something else fell foul of one of the many historical societies. 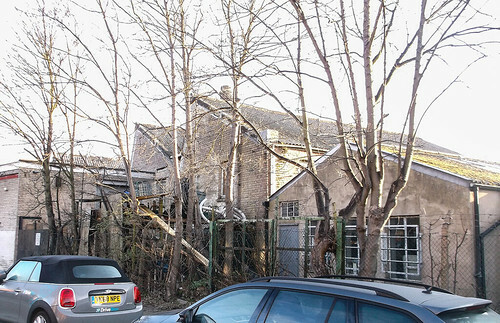 They went to court to stop the local council giving planning permission for it to be re-opened as a Travel Lodge. They lost and then bleated that the council should pay their legal fees. The hotel was converted, opened and thrives as far as I know. It's certainly not a boarded up blight on the town any more. Over on the Isle of Man, Douglas station was refurbished inside and significant changes made to the layout including moving a ticket window, For the first time in years, you can now buy souvenirs there. Before the refurb it was a vegan cafe and not much else. Enthusiasts fought the changes and the cost of this meant the toilets didn't get the refurbishment they really needed. Toilets matter. They are (I'm told) the second most important feature of any visit. Families simply don't come back to any attraction with grotty loos. Enthusiasts, who probably photograph rather than travel on the trains, prize authenticity. Quite when any development should stop isn't clear, but nothing new must happen or everything is RUINED!!! Now think of the London Eye. Built for the millennium, it was a temporary structure that only got through planning by promising to go away after a few years and stop spoiling the skyline. Can you imagine London without it now? Many stately homes have been dramatically altered since they were built. Our richer ancestors were perfectly happy to rip away the frontage to replace it with something more fashionable. Now, that frontage must be preserved at all costs with even the tiniest alteration requiring much red-tape. Why doesn't anyone suggest the Georgian pillars and windows are taken away and the building returned to its original form? When exactly does history stop? A relevant story is that of York Minster. When one wing was destroyed by fire, it was restored, but with brand new roof bosses designed with contemporary themes. These are now over 30 years old and part of history. 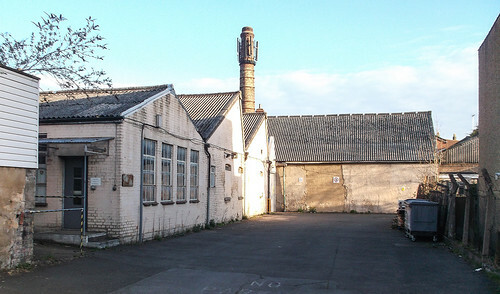 Part of the story of the building. Was this wrong? I bet someone thought so at the time. I'm pleased to see there is a competition to design a new spire for Notre Dame. I hope it isn't just a pastiche of the old one, but something bold and new. A fresh bit of the story that will gradually become part of history. Preservation is fine, but if we never allow ourselves to do something new, what exactly are we preserving and why? Just because it is old, doesn't make it better than what we do today. Old cars may have more character than new ones, but they rust and need loads of maintenance. If all you want is to jump in and go from A to B in comfort, you will be happy to travel in "dull". Steam engines are wonderful, but I bet the drivers didn't miss the early starts, filthy work and awful conditions. The day any driver walked up to to a diesel, climbed into the cab and turned pressed a button to start the engine must have seemed wonderful. They wouldn't want to go back and neither should we. Some film from the Isle of Man this time last year. Plenty of railway action for your bank holiday! My second ever model railway locomotive recently turned up when I was looking for something else. In fact, when I found it, I realsied it was what I'd been looking for. 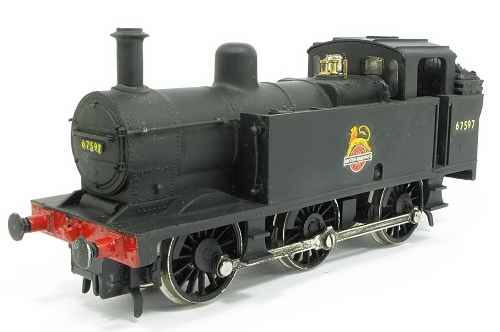 The model is a Hornby R302 Jinty 0-6-0 tank engine. It arrived in 1979 - my memory isn't that good, but I do remember that it was the era of locomotives coming a with a free "Pugh and Co." open wagon. These were destined to be collectable according to the advert at the time, but a quick search on-line reveals there are thousnads of the things kicking around. Even being boxed doesn't make much difference since so many were made. Anyway, the Jinty was supplied nicely lined out in BR black, but over the years succumbed to my detailing efforts. Handrails appeared on the tan fronts, there's a Scottish coal extension plate at the back and of course, the paint is now matt black. Except where the transfers are, because I varnished these like you were supposed to. The model still runs, and pretty well too. OK, it's not modern RTR quality with it's XO4 motor, but not badly. The Magnahesion still works too, I remmeber it causing some consternation when my dad and I had to make a trip to the Train Shop in Warwick when the loco stopped working. The assistant looked underneath, removed a track pin lifted up my the magnet and the model worked. Slightly red faces all round, but we both learned a lesson. Purists will scoff and say there are better Jintys out there and that's true, but this one deserves a place in my showcase. Big stuff this month in Garden Rail. We've the largest Product News section ever - 7 pages full of new models - mostly because I was on a mission at the recent Midlands show to grab as many photos as possible. If you like your railways ride-on, the Chris McKenzie should inspire you. He has built a line around his very modest garden, with almost no engineering skills. It wasn't all plain sailing either, but he tells it in a very humourous way. 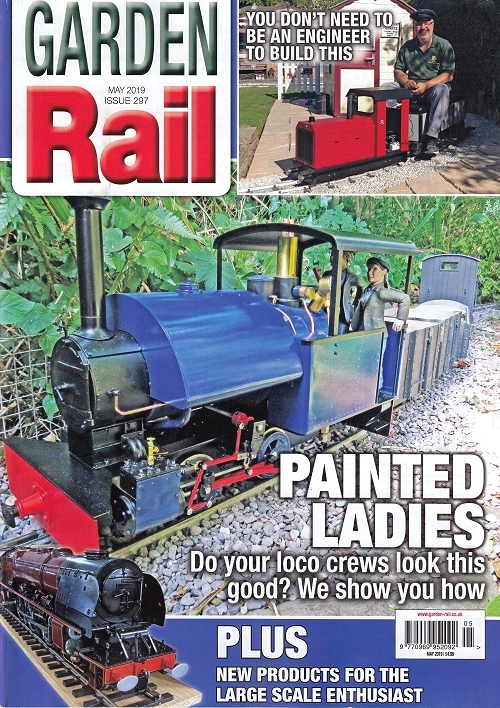 The main feature on the cover is a female loco crew painted by Steph' Hicking, an example of the high-quality modelling we're seeing in the larger scales. So, another top issue of GR - buy yours now! 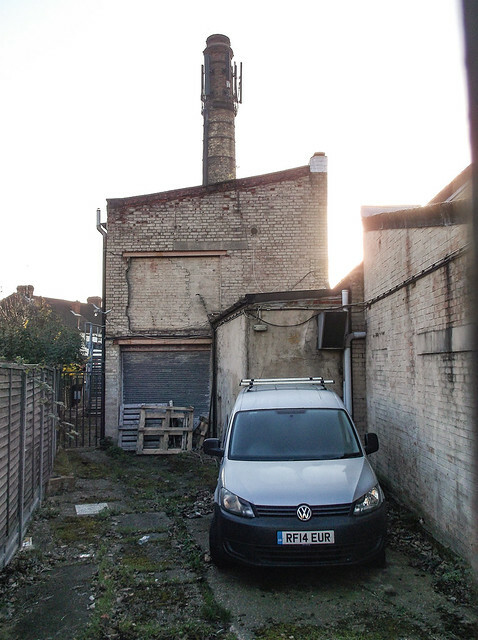 Driving to Ally Pally a few weeks ago, I was running early and decided to investigate a chimney I could see in the middle of some houses. What I found could be straight out of The Sweeny or The Professionals. 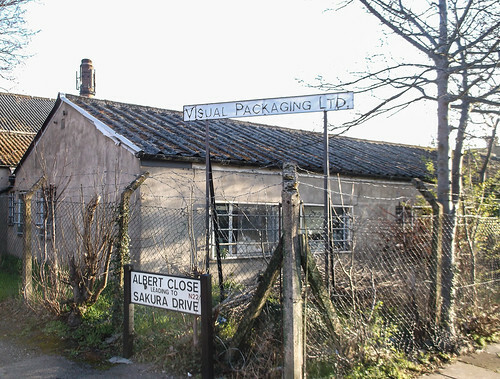 Visual Packing is a small industrial building, parts of which must date from the end of the war. Or at least that's what I guessed looking at it in the early Sunday morning sunshine. According to the web, the company manufactures polypropylene and cellophane bags and was formed in 1973. The place was a bit of a mystery until I found the website for Bowes Park and Bounds Green, when all was revealed!